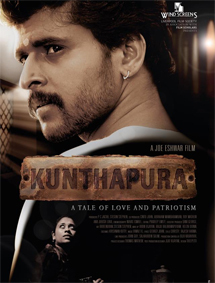 Through Kunthapura the viewers are being into the Indian world of 20s, immerses them in a battle between good and evil, and carries them on to the barricades during the uprising of 1928 with a realism that is unsurpassed film making.Within our dramatic story are themes that capture the intellect and the emotions: crime and punishment. In simple words it's the story of a village in British Mysore fighting against the Archaeological Survey of India. The ASI discovers kunthapura as the Summer Retreat of Hoysala Dynasty and wants the villagers to move away from the village for good, so that they can go on with their excavations. The village fights against it. The fight against ASI eventually ends up in what is known as the fight against the British, yet another unreported event in history. This film was conceived in 1999. So after a long 10 year time, the movie is almost over.The film is expected to be out in July , 2012. Biyon, Charuhasan, Jubil Raj, Master Mishal, Priya lal, Cauvery Rajkumar and the others did very well. compos� � h @� 8 � score. 'Athe Mazha Athe Veyil' is complete, and the film is fast getting readied for release.